Transport United came from two goals down to defeat Thimphu City 6-3, yesterday. The win takes them to the top of the national league standings. By the time Transport United rose up to the occasion, Thimphu City had already scored two goals. Chencho Gyeltshen and youngster Nima Tshering netted the two goals for Thimphu City. About twenty minutes into the match and the spectators at the Changlimithang were put on the edge of their seats. An own goal from a City defender started the Transport United revival. A free kick led to a handball inside the box and the referee had no hesitations to point to the spot. City players contested the decision in disagreement but to no avail. 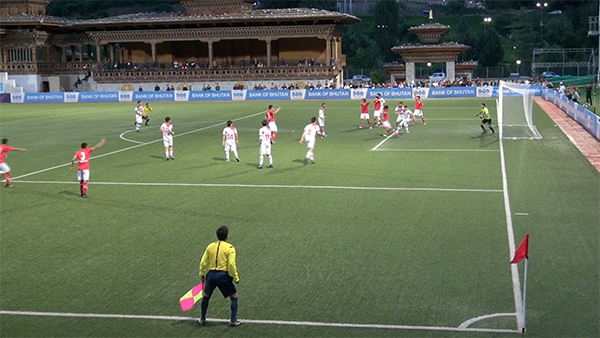 Dawa Tshering lobbed in the resulting penalty and two – two is how it finished at the break. Transport United added their third goal before a fine header from Nagin Tamang took the game beyond the reach of Thimphu City. That was when things started to get ugly. The tightly contested match between the two league leaders saw four players sent off. Tshering Samdrup of Transport United got booked for not obliging to play the dead ball from where it was supposed to be. Seconds later, Orgyen Wangchuk, who was substituted earlier, was sent off for supposedly using vulgar language and throwing a water bottle in frustration. This incident sparked off a massive standoff between the match officials and the Thimphu City contingent. Orgyen walked off to leave the field but not before Tshering Samdrup got sent off for the same offence, which got him cautioned minutes earlier. Ten men Transport United added their fifth goal but Thimphu City pulled one back when Captain Tshering Dorji scored through a penalty. Moments later came the icing on the cake. Nagin Tamang flicked a free kick beyond City goalkeeper Ngawang Jamphel to grab his hat trick. As Thimphu City pushed for a fight back, another controversy erupted. Jigme T Dorji was given a straight red card for pushing a Transport player. Nima Wangdi came out of nowhere giving the referee some foul words. He too got the marching orders. Six – three is how it finished and a huge, huge win for Transport United. With their main title challenger seen off, and just four matches remaining, the league is Transport United is closer to winning the league title for the first time.